What Are The Benefits Of CCTV Systems In Schools? We serve and specialise in many industries and market sectors. This keeps us agile in developing best of breed practices and systems across varying client environments and commercial needs. Recently statistics show that more and more schools are investing in or upgrading their current security systems. Unfortunately this is partly due to the times we live in. Just 2 days ago for example a gunman opened fire at a school in Tehema County California, injuring 7 children. While this is an extreme rare occurrence, CCTV systems can also be beneficial in order to tackle a whole host of other school related problems that thankfully, aren’t so extreme. Let’s take a closer look…. No one wants their face to be seen on camera while committing a crime. As such, just by their mere presence, it’s often enough to detract vandals and thieves from targeting the school. In addition, when students know that ‘big brother is watching’ they’re more inclined to be on their best behaviour. On some occasions vehicles on school premises can become targets. Whether it’s an upset student taking their frustrations out on their teacher’s car, or an opportunist thief looking for easy pickings, CCTV cameras have the ability to identify the culprit, so that formal action can then be taken. Many larger schools have remote exit and entry points often far away from prying eyes, As a result they can often make the perfect routes for anyone looking to gain unlawful entry. By installing security cameras, particularly those with motion sensor technology, monitors will instantly be notified when the system picks up any form of detection. In addition remote monitoring means that you can gain access to real time CCTV footage via your smart-phone, tablet, or laptop, wherever you are. What’s more, access can be accessible by selected staff. Whether that’s a security guard, or teacher, it means that they can take action swiftly should the need arise. We’ve already mentioned that students are more likely to be on their best behaviour when they know that they’re being watched and the same goes for bullies. Unfortunately bullying in schools is still a regular occurrence with approximately 72% of all Australian schools reporting at least one act of bullying. However CCTV cameras positioned in the right areas allow members of staff to monitor and pick up on any bullying activity fast, enabling them to take control of the situation before it escalates. 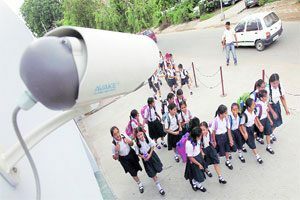 In addition to highlighting potential trouble, CCTV can also be used in schools to aid safety. In case of an emergency such as a fire or threat, CCTV cameras can be utilised to gain a quick overview of any danger areas so that if evacuation is needed it can be carried out safely and quickly. If your school is in need of a CCTV upgrade or a new installation then contact MA Security. In addition to supplying security personnel for businesses, events and individuals, we also advise on and fit security systems to suit your needs and requirements. For further information contact us on 1300 020 406 today and talk to our experienced team who can help.